The game is life, and life is “the game”. Our opponents are Satan, our own flesh, and this evil world. While the game of life is nothing to play with, the analogy is worth studying. We play or live to win. And how do we win? The Bible tells us that “every child of God can obey him, defeating sin and evil pleasure by trusting Christ to help him. But who could possibly fight and win this battle except by believing that Jesus is truly the Son of God?” (New Century Version) In other words, “everyone who is a child of God conquers the world. And this is the victory that conquers the world — our faith. So the one who wins against the world is the person who believes that Jesus is the Son of God.” (The Living Bible). Just think of some of the greatest comebacks in sports history. Who can forget the Boston Red Sox coming back from 0-3 to defeat their arch rival, the New York Yankees, in the 2004 AL Championship series? And of course the Sox went on to sweep the St. Louis Cardinals to win the World Series for the first time in a gazillion years. And in football, the NY “Football” Giants beat the heavily favored New England Patriots in the Super Bowl – not once, but twice. In hockey we can’t forget the “Miracle on Ice” when the U.S. Olympic Hockey Team won the Gold medal in 1980 at the Lake Placid Games. And let’s not leave out basketball. 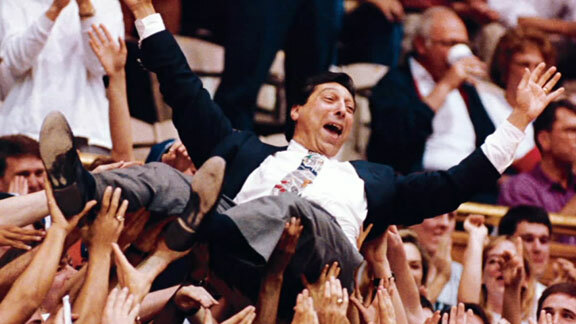 The greatest college upset of all time came when the N.C. State Wolfpack coached by Jimmy Valvano defeated the heavily favored University of Houston juggernaut nicknamed “Phi Slamma Jamma.” Houston had Hakeem “The Dream” Olajuwon and Clyde “The Glyde” Drexler on their team. Yet and still, N.C. State pulled of the upset victory. The lesson for life is this: we can overcome any deficit, any obstacle, any challenge with God’s help. Our faith gives us victory. Our trust in God allows us to be more than conquerors. Our belief that Jesus is the Son of God gives us to overcome the world, our sinful flesh and the devil. What are some of the greatest comebacks in sports? What are some of the greatest comebacks in life? Please share them with us.